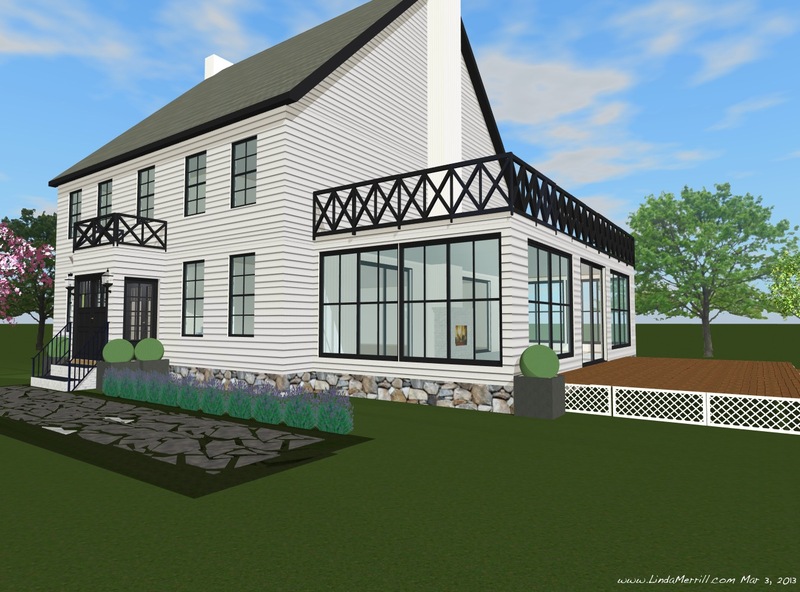 I’ve set out a new challenge for myself, which is to design my own “Dream Home” and I’m inviting you along for the ride! This exercise is, in part, to give me ample opportunity to work on my digital rendering skills, but also to really think about what I would want if this were a real project and I was the client. 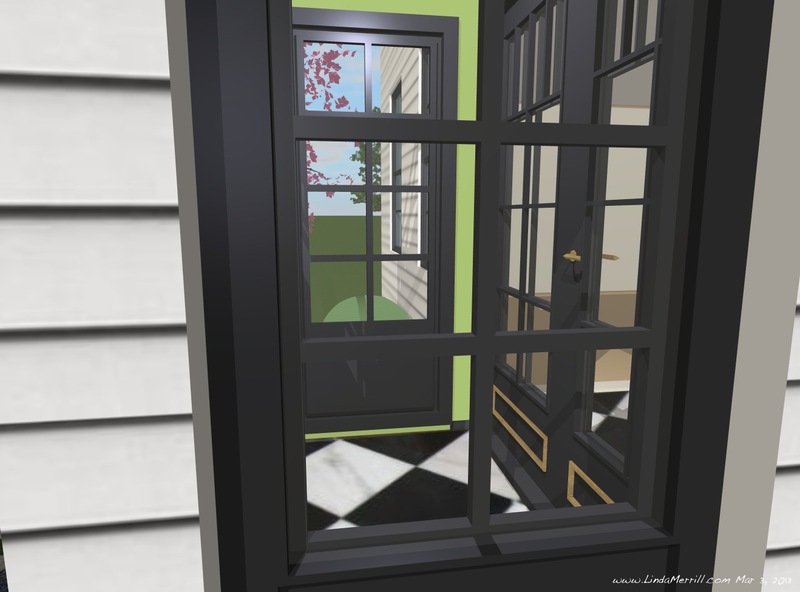 I decided not to let the simple fact that I have no budget stop me from creating the home of my dreams – especially since we have a virtual world to play in. While money is no object (hey, it’s my fantasy after all!) I do intend to incorporate some of my actual possessions and family heirloom pieces into the mix and I will make them work! The house may be new construction, or it might be that I find a great antique house in a wonderful location that I would fully renovate. 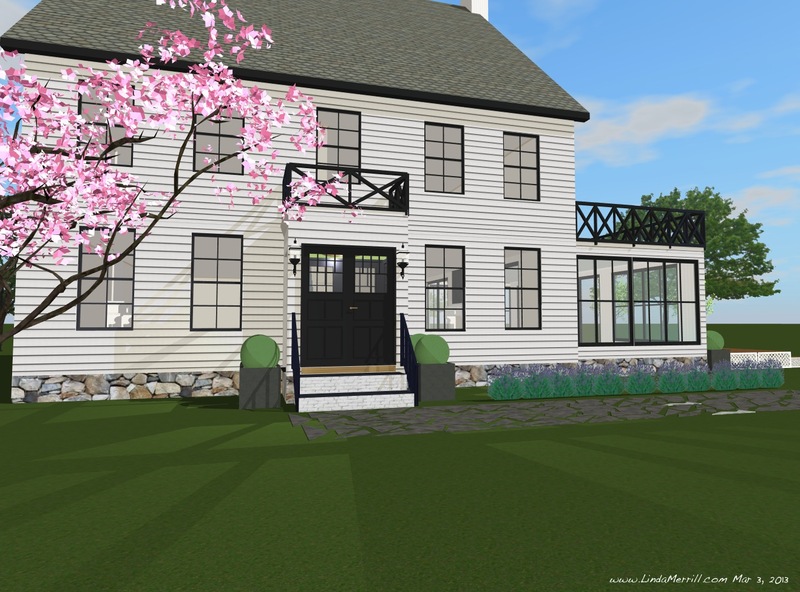 So, my design plan starts with a very traditional center entrance colonial style home. One house I am very inspired by is Florence de Dampierre’s house in Connecticut. I just love the green door – such a shot of energy. I love the design of this house as well, but it’s not my dream house. And so, here is my first round of design work, starting on the exterior, which as you can see features clean lines. I’m still on the fence about using shutters or not, but my guess is that I will make the decision closer to the end of project. 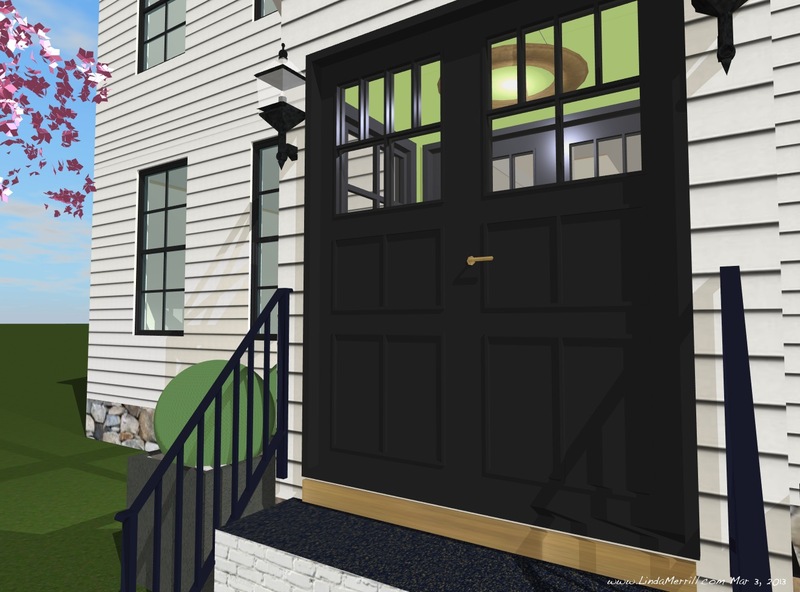 One of the cool things about digital rendering (I use Live Interior 3D Pro for Mac) is that you can add in features like shutters and then “hide” them if you want to see the view without the element in question. No need to delete and re-add. They are still in the project, we just can’t see them. 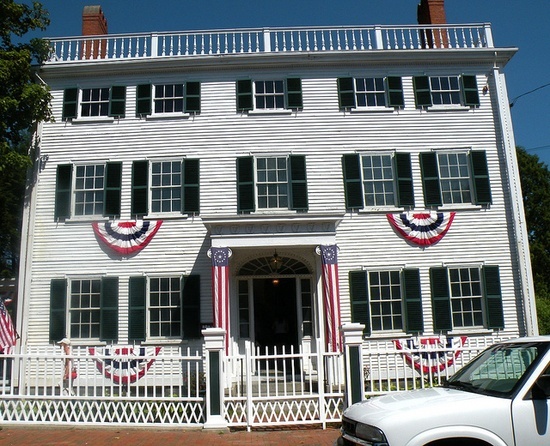 So, as we see, the main house has a center entrance with an extended closed entry-way. I love, love, looking into spaces through doors and windows and love the option of having this element. On the right side (when facing it) of the house will be a sun porch (with fireplace!) and a deck that stretches off the porch. You will note I don’t have the windows on the 2nd floor over the deck in yet. I’ve not yet decided if the sun porch will be off the kitchen or the living room – the insides are completely bare at the moment. And I’m not sure if the sunporch will be quite as large as it is. Decisions, decisions! I think the roof deck over the sun porch will be off the master suite – but again I’ve not spent anytime yet with the insides. I may want to do something completely unexpected with that space as well. I don’t love huge houses and think that a smaller house leaves more in the budget for finer details! This house, as it is now, is about 2,600 sq. ft. Not too small, definitely not too big. Here’s a close up of the entryway. You will see in the “windows” that I’ve painted the inside walls and ceiling a bright green – Benjamin Moore’s “Stem Green”. I love the idea of it peaking out as a sort of surprise to visitors. And here’s another view looking into the entry where I’ve laid a black and white marble floor on the diagonal. This flooring will also be in the front hall and probably also the kitchen. Of course, many of these details will likely change over time. One thing I’m thinking as I “peek” into my own window above is that I should add benches in here with boot storage below or something along those lines. I’ve started a Pinterest board with my inspirations and selections, which you can view here. Anyway, I hope you will enjoy following along. And keep your fingers crossed that I win the lottery some time soon. I never play, so maybe cross your toes too!